Retail electricity licensees (electricity retailers) are companies authorised by EMA to retail electricity to contestable customers. There are two types of electricity retailers: Market Participant Retailers (MPRs) and Non-Market Participant Retailers (NMPRs). MPRs have to be registered with the Energy Market Company (EMC) to purchase electricity from the National Electricity Market of Singapore (NEMS) to sell to contestable consumers. NMPRs need not register with EMC to participate in the NEMS, since they will purchase electricity indirectly from the NEMS through the Market Support Services Licensee (MSSL). For more information on becoming a retailer, you may refer to our Guide to Becoming a Licensed Electricity Retailer. 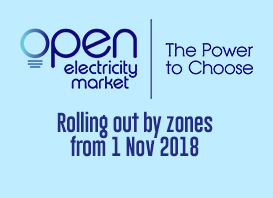 For the nationwide launch of Open Electricity Market starting 1 November 2018, households and small businesses can choose to buy electricity from a retailer at a price plan that best meets their needs. View the list of retailers participating in Open Electricity Market.